TVS has launched its new 110 cc commuter bike, Radeon, which comes with a price tag of Rs 48,400 (ex-showroom, Delhi). 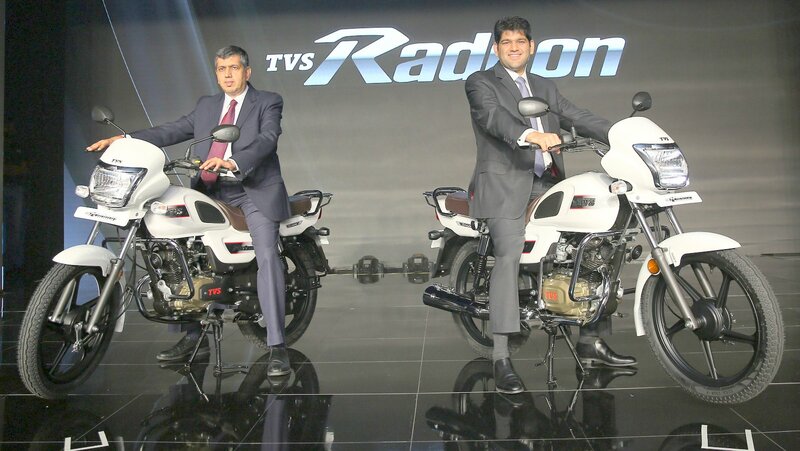 TVS already has TVS Sport and TVS Victor in the 100-110 cc segment and the newest offering TVS Radeon will be positioned alongside the two in the company’s line-up. The addition of TVS Radeon will provide more options to customers in the volume-driven and price sensitive 100-110 cc segment. Other leading two-wheeler manufacturers also have multiple product offerings in this segment. What’s new in TVS Radeon? – TVS Radeon primarily targets the young rural market that comprises commuters in the age group of 25-35 years. Some new features have been introduced such as knee pads on the fuel tank, which adds both comfort and style. There’s also a striking golden coloured engine cover that’s most likely meant to get your attention. It’s usually black seats for commuter bikes, but here too, TVS Radeon has redefined the trend by offering brown seats. These new additions give a distinctive character to Radeon, and may be appealing to customers. In terms of styling, TVS Radeon is comparable to Honda CD 110 Dream DX, which was launched recently. Other primary rivals are Hero Splendor Plus and Bajaj Platina 100 ES, which have remained popular for a long time. TVS Radeon offers improved design and styling as compared to Splendor Plus and Platina. Optional features in Radeon include a 5-step adjustable rear suspension and USB charging port. New TVS Radeon could help the company rev up its sales, provided that it has something better to offer in comparison to rivals. So, how does TVS Radeon compare vs. its rivals? Well, let’s find out. 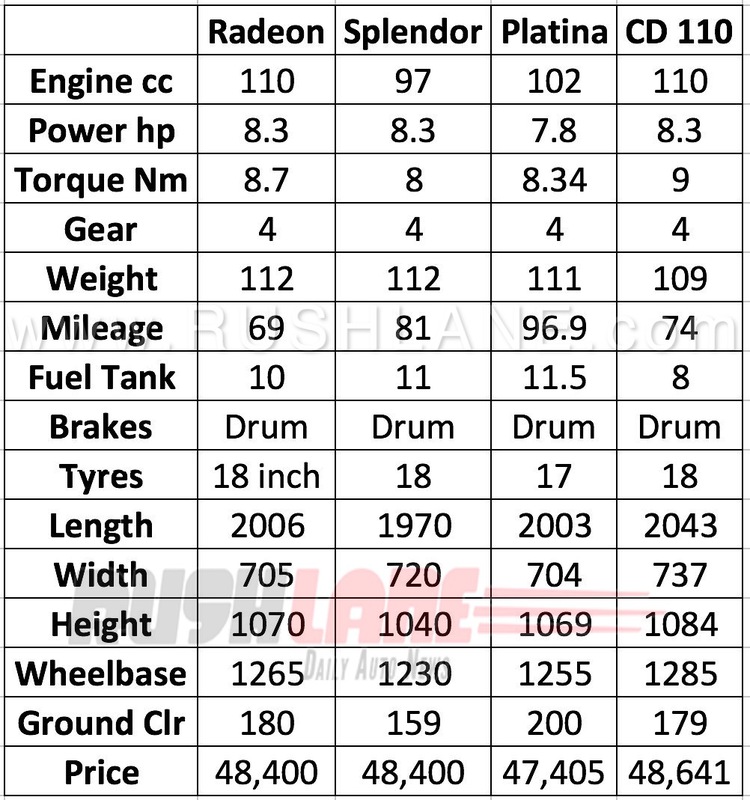 Here is TVS Radeon vs Hero Splendor vs Bajaj Platina vs Honda CD 110 comparison. Engine Type: There’s no difference here, as all four bikes have the same single-cylinder, air-cooled engine. Displacement: At 109.7 cc, Radeon scores over Splendor’s 97.2 cc and Platina’s 102 cc. However, it is slightly lower than Honda’s 109.19 cc. Max Power: Delivering 8.3 bhp @ 7,000 rpm, Radeon’s max power is almost the same as Honda’s 8.31 @ 7,500 rpm and Splendor’s 8.3 bhp @ 8,000 rpm. Platina has the lowest power rating of 7.8 bhp @ 7,500 rpm. Max Torque: With 8.7 Nm @ 5,000 rpm, Radeon has a higher torque rating than Splendor Plus (8.05 Nm @ 5,000 rpm) and Platina (8.34 Nm @ 5,500 rpm). Honda delivers the highest torque – 9.09 @ 5,000 rpm. Gearbox: No difference here, as all four bikes have 4-speed manual gearbox, which is the standard in the 100-110 cc segment. Fuel efficiency: At claimed fuel efficiency of 69.3 kmpl, Radeon is the least fuel-efficient among the four bikes. Platina has the highest claimed fuel efficiency of 96.9 kmpl, followed by Splendor Plus (81 kmpl) and Honda (74 kmpl). Kerb Weight: There’s not much difference here, as all four bikes have almost similar kerb weight – Radeon (112 kg); Honda (109 kg); Splendor Plus (112 kg); and Platina (111 kg). Ground Clearance: At 180 mm, Radeon has a higher ground clearance than Honda (179 mm) and Splendor Plus (159 mm). Platina offers the highest ground clearance of 200 mm. Ground clearance can be an important factor for consumers in rural markets, as one may have to negotiate rough, uneven roads. Starting Price (Ex-showroom Delhi): Since the 100-110 cc segment is highly price sensitive, Radeon has matched its pricing (Rs 48,400) with that of Honda (Rs 48,641) and Splendor Plus (Rs 48,400). At Rs 47,405, Platina is the lowest priced bike among the four. The Verdict: TVS Radeon can be a good option, but a lot depends on what matters to you most. For example, if you are looking for superior styling, you can consider either TVS Radeon or Honda CD 110 Dream DX. If mileage is the thing you want, Radeon would be the last choice for you. In terms of power, you can choose Radeon, Honda or Splendour Plus.